Vanuatu’s President Baldwin Lonsdale broke down yesterday as he made an emotional plea for international help for his cyclone-ravaged country, which aid agencies claimed had left more than 100,000 people homeless. Speaking from the Japanese city of Sendai, where he had been attending a United Nations conference on disaster risk reduction, Mr. Lonsdale said: “As a nation, as the head of a nation, my heart is for the people. His voice quavering, he spoke of the particular difficulties faced by the impoverished nation of 267,000 people spread over scores of scattered islands. 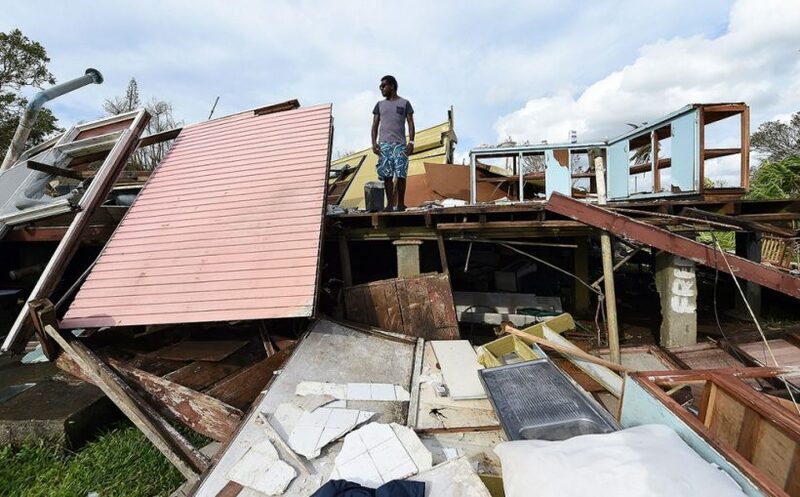 As emergency relief flights from Australia and New Zealand arrived in the beleaguered capital Port Vila on Monday, aid workers described the conditions as among the worst they had faced. 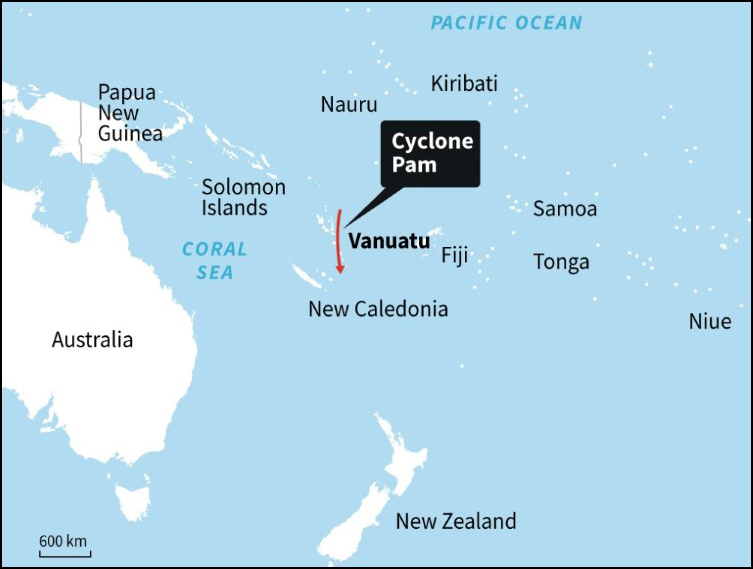 Cyclone Pam, one of the most ferocious tropical storms in living memory, lined up the islands of Vanuatu for a direct hit as it ploughed southeast through the Pacific Ocean, packing gusts of up to 190 miles per hour. Almost every building in Port Vila, the capital with a population of 47,000, has been either damaged or destroyed. 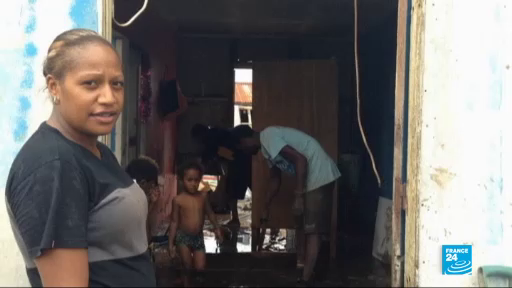 The southern island of Tanna was described by a Red Cross aid worker as being “in ruins”. Although the official death toll stands at eight, that was expected to rise once outlying islands with poor communication links could be reached. CARACAS | Ridiculing the U.S. [classifying] Venezuela as a security threat, President Nicolas Maduro said on Thursday he may travel to Washington to challenge American counterpart Barack Obama. In the worst flare-up between the ideological enemies since Maduro took power in 2013, the Obama administration last week declared a “national emergency” over “the unusual and extraordinary threat” from Venezuela and sanctioned seven officials over allegations of rights abuses and corruption. U.S. officials say the Obama government’s intention is to make Venezuela’s government change its ways, not fall. President Maduro, the 52-year-old successor of firebrand U.S. adversary Hugo Chavez, said Venezuela was preparing an event in Washington to press its case. “Maybe I’ll appear in Washington at that exhibition, to show my face for my country and tell the government in Washington they are committing grave mistakes,” he said. No more details of the event were given. Opposition leader Henrique Capriles accused Maduro of using the spat as a smokescreen. “Inflation through the roof. Scarcities too. Murders and poverty up. And the shameless rulers talking to us of an invasion,” he tweeted. Venezuela’s opposition coalition has sought to disassociate itself from any perception of supporting outside meddling, while supporting the allegations of repression and graft. Allies from Russia to Argentina have sent messages of support to Venezuela, as has the South American regional bloc UNASUR. 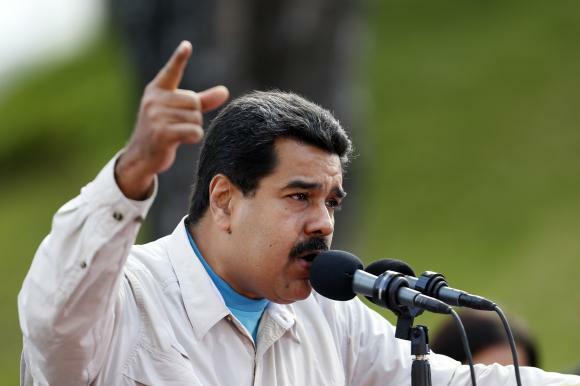 … Whipping up nationalist sentiment, Maduro addressed an “anti-imperialist” march on Thursday, while over the weekend the National Assembly granted him special decree powers he says are needed after the U.S. moves. The lights are going out all over Syria. Research published to mark the fourth anniversary of the Syrian uprising has shown the amount of light being released over the country has shrunk by 83 percent. Satellite imagery taken at night was used to chart the progress of the war by researchers at Wuhan University in China. They show the glow from major population centers like Aleppo and Homs gradually dim. Aleppo, which has been divided between pro- and anti-regime halves since July 2012, has lost 97 per cent of all its light. Its biggest industrial zone has also been a battle-zone, with mainstream rebels, jihadists from Al-Qaeda and Islamic State of Iraq and the Levant, and regime forces controlling it by turns. Damascus by contrast has suffered less, losing just 35 percent of its light – a sign of the firm grip on the city cenere still held by the regime of President Bashar al-Assad. The researchers have also found that there is a direct correlation with the number of refugees from an area and the loss of light. The research was commissioned by an alliance of non-governmental organizations to highlight the plight of civilians as the war rages around them. More than 200,000 people have been killed during the war, and more than 3.5 million people have fled the country. Including those displaced internally, half the pre-war population of 22 million are refugees. “Syria’s people have been plunged into the dark: destitute, fearful, and grieving for the friends they have lost and the country they once knew,” said David Miliband, the former Foreign Secretary who is now president of the International Rescue Committee. b) Read the “Background” below and watch the news report under “Resources.” What do you think will be the biggest problem the country faces in the aftermath of this devastating storm? b) What does socialist President Maduro demand President Obama do regarding the sanctions? c) President Obama imposed sanctions on Venezuela by executive action, not through Congress, which is most likely the more usual route. The Obama administration says that Venezuela threatens U.S. security. Regarding U.S. relations with Iran, President Obama wants to lift all sanctions against that country as it continues its nuclear weapons program. The Republican-led Congress wants to impose more sanctions on Iran (not lift any) to force them to end their nuclear program, which threatens U.S. security. What do you think of the President and of Congress’ differing views on these two countries? Ask a parent to explain his/her perspective. b) Ask a parent or a grandparent: Do you think the U.N. should do anything to stop this devastation? Tom Skirrow of Save the Children said the logistical challenges were even worse than after Super Typhoon Haiyan, which struck the Philippines in November 2013, killing more than 7,350 people. “I was present for the Haiyan response and I would 100 per cent tell you that this is a much more difficult logistical problem,” he told the AFP news agency. Mr. Skirrow said 15,000 people were homeless in Port Vila alone and flights over remote islands had confirmed widespread destruction. As the first relief flights arrived from Australia and New Zealand, charity workers warned that diseases such as dengue fever and malaria were a concern because of widespread flooding and contaminated water supplies. Venezuelan President Nicolás Maduro on Sunday was given the right to rule by decree for nine months, as he continued to capitalize on the backlash created by recent U.S. sanctions. The law, which gives Maduro the ability to bypass congress in issuing security and defense legislation through December 2015, went into effect Monday when it was published in the official gazette. Maduro didn’t say how he will use his new powers, but the opposition worries that the socialist administration will continue to crack down on dissent in the run-up to legislative elections. Maduro has managed to portray the U.S. sanctions against seven officials as a major threat to the South American nation. In particular, Venezuela and other regional governments have been alarmed by the language in President Barack Obama’s March 9 executive order. The document declared a “national emergency” – a prerequisite to enacting sanctions – and called Venezuela a threat to U.S. national and foreign interests. Bolivian President Evo Morales, a Caracas ally, said Washington needed to apologize for the affront or face a backlash during the Summit of the Americas, which will be held next month in Panama. Building on that idea, Maduro on Sunday said the leaders of the nine-member ALBA group of nations, which includes Cuba and Nicaragua, will be meeting in Caracas on Tuesday to form a common front against the U.S. at the summit. Venezuela has been mired in chaos as sinking crude prices and economic mismanagement have restricted access to the foreign currency needed to finance imports. As a result, basic items are often hard to come by and inflation is among the highest in the world. Earlier this month, the government began installing fingerprint scanners at state-run stores to try to crack down on hoarding. And last year, Maduro was given decree powers for six months to deal with the economy.